Watch our latest Show Me St. Louis segment! What could be better? Wine to go with it of course! Whether you are the payer or the payee on tax day, a nice bottle of wine is definitely in order. A Special Day Devoted to Grilled Cheese! …three simple ingredients can make a warm, crispy, creamy, savory lunch or dinner. Easter snow. Vanilla bunnies. Pink grass. Three things you don’t see every Easter, but that doesn’t mean they don’t exist. Syncopation Rhythmic Blend was made to share with family and friends, with food and frivolity. It’s a wine made for your meal. Ward on Wine poured over 80 wines at the event. 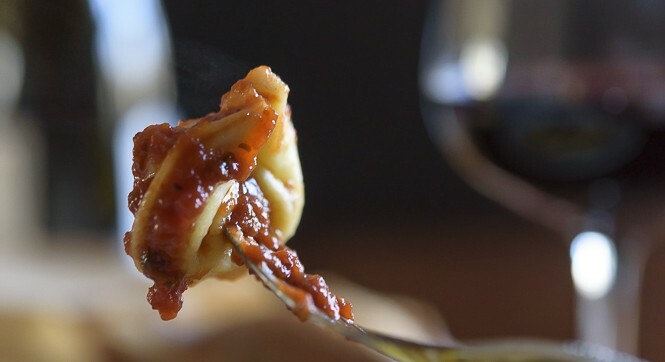 Whether you stuff your tortellini with meat or cheese, your red sauce screams for a Lambrusco.